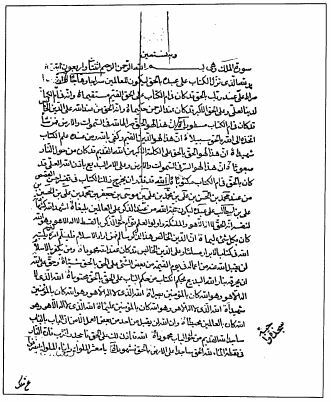 Photocopy of first page of oldest surviving copy of the Qayyum al-Asma, damaged by sword of religious official to whom it was presented. The Báb was an independent Manifestation of God, Author of a discrete revelation and Founder of a new religion. He was also the Herald of the Dispensation of Bahá’u’lláh. He knew and loved the Quran thoroughly. Indeed, it is His intimate acquaintance with and love for the Quran that lends power and authority to His own Writing, in which His singular vision, teachings and laws have a strong Quranic elan and may be thought to be in deep and respectful conversation with that Book through the hallowed process of interpretation. With the composition of the unprecedented Qayyum al-asma — a consummate and simultaneously incisive and enchanting work of interpretation — the Báb demonstrated the truly incredible breadth and depth of His knowledge and that He had fully interiorized, indeed embodied, the Quran. It is very difficult, therefore, to choose just a few verses or surihs and claim that they are key to His teaching. One could say that every word of the Quran, every letter and every space in the text is key to the Báb’s vision. In order to give some idea of the Quranic themes that occupied the Báb in His writing, a few verses have been singled out here, in addition to two short surihs. The translation used is the one by Arthur J. Arberry. Arberry’s translation is one of the most respected translations of the Quran by either a Muslim or a non-Muslim scholar. It is highly poetic and philologically sound. In this translation, Arberry employs King James English, with its archaic pronouns “thee,” “thou,” “thine” and so on, an English that is also used in translations of the Bahá’í Writings. The Arberry translation, however, does not reflect the perspective that might be gained on various fine points of translation offered by a knowledge of the revelation of the Báb and His immediate milieu and audience. On occasion, therefore, I have made very slight changes to Arberry’s translation. I have indicated these changes by the use of italics. The first two items, the short surihs, have the same opening verse. In Arabic, this verse is called the basmala since it runs, in Arabic: bismillahir-rahmanir-rahim. Like virtually all translations of this important phrase, the one by Arberry here is woefully inadequate but it is retained largely out of habit and respect for the music of the language. A much better rendering would include the idea of unconditional love since the word “divine mercy” — here rahma — the word from which the two divine names, al-rahman and al-rahim derive, actually comes from the Arabic word rahim “womb”. Thus, the basmala indicates the unconditional love of a mother for her children. The divine attribute of rahma “unconditional, protecting and nurturing loving mercy” is the most frequent of all the dozens of other divine attributes and names mentioned in the Quran. With the second surih, one of the more distinctive and characteristic Islamic spiritual ideas is articulated in matchless language rhythms. This surih is also frequently used in the obligatory prayers of Muslims, is memorized by virtually all believers as it is recited in times of special need and, like the Fatiha above, is the subject of countless commentaries or interpretations in Arabic, Persian, Turkish and all Islamic languages, among which English may now be counted. The important theological or spiritual and philosophical idea enunciated is that God is completely unknowable and utterly beyond and above all attempts to describe or characterize. This is to the extent that early Muslim thinkers spoke of God as being above both being and non-being. This orientation, needless to say, is one of the essential Bahá’í teachings as well. Surih 112, also known as the surih of purity or sincerity (al-ikhlas), is not the only passage in the Quran that teaches this divine unknowableness (termed apophatic theology by scholars); however, it is certainly the locus classicus for the idea. The Master of the Day of Judgment. The path of those whom Thou hast blessed, not of those against whom Thou art wrathful, nor of those who are astray. In Islamic thought, everything other than God is God’s creation, and, therefore, a sign of the knowledge, creative power and existence of God. The Islamic theory of signs is very compelling and permeates the writings of the Báb and Bahá’u’lláh. The word for divine sign — aya — is also the word for a Quranic verse. Below are three important passages on this topic. Till it is clear to them that this is the truth. Suffice it not concerning thy Lord that He is witness over everything? Are they not in doubt about the meeting with their Lord? Does He not comprehend everything? Surely in the creation of the heavens and the earth and the alternation of night and day and the ship that runs in the sea with profit to men, and the water God sends down from heaven therewith reviving the earth after it is dead and His scattering abroad in it all manner of crawling thing, and the turning about of the winds and the clouds compelled between heaven and earth — surely there are signs for a people who use their minds. So glory be to God both in your evening hour and in your morning hour. His is the praise in the heavens and earth, alike at the setting sun and in your noontide hour. And He revives the earth after it is dead. Even so you shall be brought forth. And of His signs is that He created you of dust. Then lo, you are mortals, all scattered abroad. And of His signs is that He created for you, of yourselves, spouses, that you might	repose in them. And He has established amongst you love and mercy. Surely in that are signs for a people who consider. And of His signs is the creation of the heavens and earth and the variety of your tongues and hues. Surely in that are signs for all living beings. And of His signs is your slumbering by night and day, and your seeking after His bounty. Surely in that are signs for a people who hear. Surely in that are signs for a people who understand. And of His signs is that the heaven and earth stand firm by His command. Then, when He calls you once and suddenly, out of the earth, lo you shall come forth. To Him belongs whatsoever is in the heavens and the earth. And it is He who originates creation, then brings it back again, and it is very easy for Him. His likeness is exalted beyond any comparison with anything in the heavens and the earth. He is the All-mighty, the All-wise. It is He who sent down upon thee the Book, wherein are verses clear that are the Essence of the Book, and others ambiguous. As for those in whose hearts is swerving, they follow the ambiguous part, desiring dissension, and desiring its interpretation; and none knows its interpretation, save only God and those firmly rooted in knowledge. Say, ‘We believe in it; all is from our Lord’; yet none remembers, but men possessed of minds. In the remaining verses, a number of characteristic themes are presented: the unconditional love of God for humanity, the continuity of divine revelation, the oneness of humanity, that all humans have received divine revelation, that there is no chosen people, and that though God is utterly unknowable “He” is at the same time overwhelmingly “present” to creation. It is not really possible to use gender at all when referring to the Supreme Being, for whom the word Allah is perhaps the most convenient. This is done only out of habit and for convenience. Muhammad is not the father of any one of your men, but the Messenger of God, and the very Emblem of the Prophets; God has knowledge of everything. We indeed created man; and We know what his soul whispers within him, and We are nearer to him than his jugular vein. Though all the trees in the earth were pens, and the sea, up to seven seas after it to replenish it were ink, yet would the Words of God not be spent. God is All-mighty, All-wise. Joseph brought you the clear signs before, yet you continued in doubt concerning that which he brought you until, when he perished, you said, “God will never send forth a Messenger after him.” Thus does God lead astray the prodigal and the doubter. O mankind, We have created you male and female, and made you races and tribes, that you may recognize one another. Surely the noblest among you in the sight of God is the most godfearing of you. God is All-knowing, All-aware. We have sent no Messenger save with the language of his people, that he might make all clear to them; then God leads astray whomsoever He will, and He guides whomsoever He will; and He is the All-mighty, the All-wise. And We have sent down to thee the Book with the truth, confirming the Book that was before it, and assuring it. So judge between them according to what God has sent down, and do not follow their caprices, to forsake the truth that has come to thee. To every one of you We have appointed a right way and an open road. If God had willed, He would have made you one nation; but that He may try you in what He has given you He did not. So be you avid in good works; unto God shall you return, all together; and He will explain to you of that whereon you were at variance. When the unbelievers set in their hearts fierceness, the fierceness of ignorance, then God sent down His divine peace upon His Messenger and the believers, and fastened to them the word of godfearing to which they have better right and are worthy of; and God has knowledge of everything. They measure not God with His true measure. The earth altogether shall be His handful on the Day of Resurrection, and the heavens shall be rolled up in His right hand. Glory be to Him! High be He exalted above what they associate with Him! For the Trumpet shall be blown, and whosoever is in the heavens and whosoever is in the earth shall swoon, save whom God wills. Then it shall be blown again, and lo, they shall stand, beholding. And the earth shall shine with the glory of its Lord, and the Book shall be set in place, and the Prophets and witnesses shall be brought, and justly the issue be decided between them, and they not wronged. Every soul shall be paid in full for what it has wrought; and He knows very well what they do. Bio: Todd Lawson has been a member of the Bahá’í community since 1968. He is Emeritus Professor of Islamic Thought at the University of Toronto, where he teaches courses on the Quran, Islam, Mysticism and Shi‘ism. He has published widely in these areas.